Pinterest has a wonderful plan for my life. I’m new to Pinterest. I really have no clue to what it is about, but one team from my Social Media Class focused on Pinterest—so I’m right there! So far I’ve search for (pinned?) exactly two things: an attic fan and a pair of boots. 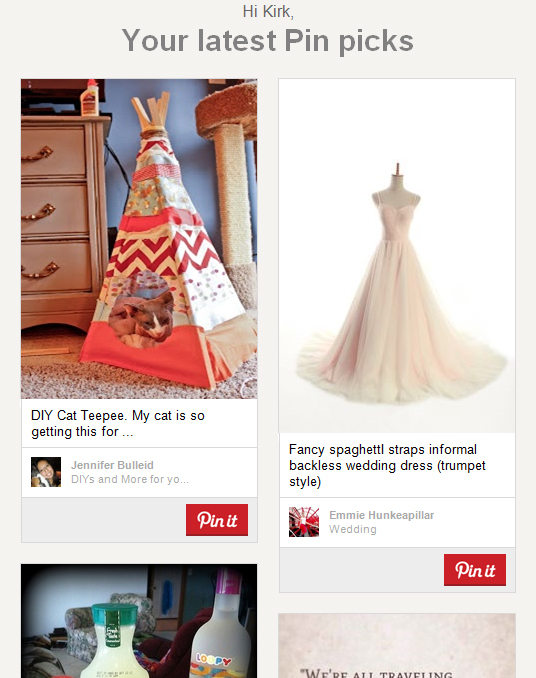 Yesterday Pinterest came right back at me with…a DIY cat teepee. And a backless wedding dress. I’m no cat fancier. And I’m more of a rent-a-tux kind of guy who enjoys being (already) married to Mrs. Kirkistan. But all this failure makes me wonder if Pinterest is curating my life into some odd, unforeseen direction. What is Pinterest’s wonderful plan for my life? And I will say with all honesty I had not searched on wedding gowns. Though I’ll admit to watching the occasional cat video.